It is Srey Yaputhsavdy’s propensity to preserve the past. 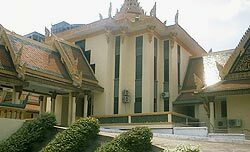 The 47 year-old head of the Mores and Custom Mission department in Phnom Penh's Buddhist Institute assumed his post because he knew it was right. With the strong support of his family and his love for Khmer culture, Srey Yaputhsavdy decided to leave France in 2000 to work as a volunteer in his homeland. That year, his contributions to the religious community were recognized as valuable and he was offered the job he still holds today. Under the bloody Khmer Rouge regime, many aspects of Khmer culture were banned and ultimately destroyed to ensure that the next generation of Cambodians emerged pure and untainted. Monks, intellectuals and artists were Pol Pot's focal target. Although many of those cultural pillars since have crumbled, several Khmer intellectuals living outside Cambodia, like Srey Yaputhsavdy, still are working to ensure that Khmer culture stays alive and well. After the rain, the sky is clear. This Khmer proverb bears witness to the situation following Pol Pot's demise, when the Cambodians that fled the country returned to their homeland. Some have returned for the love of their country, to help Cambodia emerge from darkness and forge a future lit with hope. Srey Yaputhsavdy is one such person. It is his mission to rescue the lost or disappearing remnants of Khmer culture that will teach future generations about what and who Cambodia once was. "I love the culture and would like to reveal some plants in Cambodia that people do not know yet," he said. The Mores and Custom commission currently is helping Srey Yaputhsavdy to achieve his goal. His nine-person team is made of talented professionals working to elucidate the fading traces of Khmer culture and heritage. Although not often considered to be a part of culture, plants contribute heavily to the makeup of a country and its civilization. Srey Yaputhsavdy's team works to research and record plants from the past that Cambodia and the world presently are not aware of. It also is working preserve Satra, Buddhist documents written on palm leaves. The team records their findings in books to be reserved at the Buddhist Institute's library. Srey Yaputhsavdy and his team recently finished research about rare plants like lacquer, rattan, Klehm Chan. "The research needs at least three weeks to finish. The research then can be published into book within three months'', Srey Yaputhsavdy said about his process of discovery. "When the book is finished, we send it to the Buddhist Institute's library where many Khmer students and monks are waiting to read it." 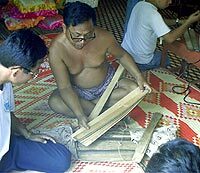 They also studied the activity of bees, the origin of Pursat marble and how ancient Khmers produced Choa Choahk, a toxic resin used to poison the tips of arrows. After the team's findings are printed, the public may read about Khmer traditions like Chol Mlob, the learning process for Khmer women prior to marriage, as well as the act of head shaving. The team also will record their findings on the work of Ancient midwives, the rituals performed to celebrate a new house, and the tradition of ordaining monks. "After 1979, some aspects of Khmer culture disappeared, and few people acknowledged the value of our culture," Srey Yaputhsavdy said. "In order to keep these cultures and traditions alive, I and we, all Cambodians, need to preserve them. They do not only belong to me, but to all Cambodians." His comment reaches beyond the confines of Cambodia into the far reaches of the world where Khmers who have fled the country are living. His call for cultural preservation hints that all Cambodians, not just those struggling to survive against the ravages of poverty and political instability, must partake in this campaign. Srey Yaputhsavdy does his work for the love of his country, not for the love of money. As the head of the Mores and Customs department, he earns a monthly salary of 54,500 riel (about $14) from the government and $50 dollars from the Heinrich Boel Organization of Germany. He said the rewards of his work and the talent of his team are incentive enough to keep going. The team is a tightly knit group comprised of Chen Tithirith, Som Vannak, Keo Ratanak, Rich Chamroeun, Ou Seren, Miss Ngem Chenda, Miss Hun Chansocheata and Miss Sinak. To complete their work, they must travel to the provinces, where they stay with local villagers. Work is not always easy and often is riddled with problems. Some extremely remote sites have proven dangerous, Srey Yaputhsavdy said, but have never prevented the team from accomplishing their goal to uncover the past.